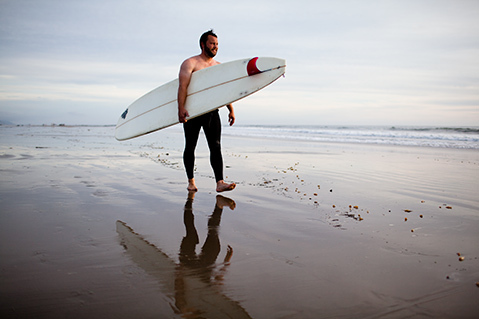 “I like the sense of connection with nature, the serenity, and challenge of this sport,” said Chris Carr of surfing in Carpinteria. Carr, who surfs at least five days a week, enjoys playing with his kids and is an active member of Reality church. “I feel like you’re never done learning with this sport. The minute you think you are, you’re humbled by the ocean,” he added. “We’re enjoying the sunset and watching my boyfriend surf. 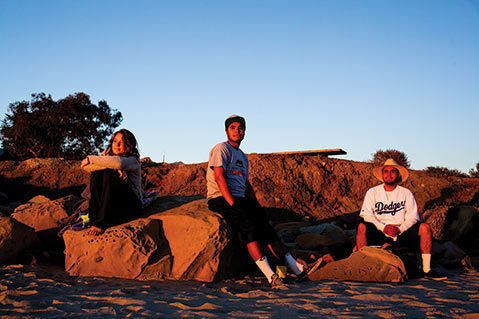 I try and get out here every day as long as I don’t get off of work too late,” said Caroline Ross (far left) while she and her friends Hipolito Arroyo (middle) and Erick Garcia enjoy a crisp evening at Carpinteria Tar Pits Park.